Let us bring the party to you! Our Animal Land Build-Your-Own, build your own animal, rental is sure to stir curiosity and excitement as your guests arrive. 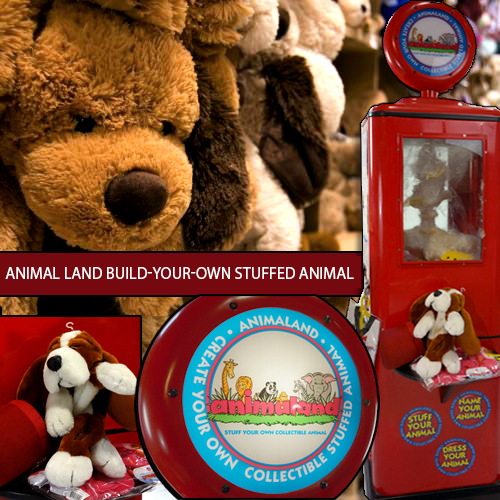 Animal Land Build-Your-Own encourages creativity and individuality as each child has the opportunity to create their own special stuffed animal. First you pick the animal you want to create, then you add the stuffing with our stuffing machine, next comes the best part, you make a wish and put a wishing star inside your new animal-then your animal is all set to love! Additional clothing options are sure to make a memorable event and celebrate uniqueness. Including Animaland at your next event is a no-brainer! The options are endless as you can pick from numerous stuffed animal choices here. Or perhaps, you are using Animaland to enhance a party theme, if so, check out the themes to choose from and let us do the rest! Plus, each animal comes with it�s own birth certificate! And you can even go online and register on the official website. 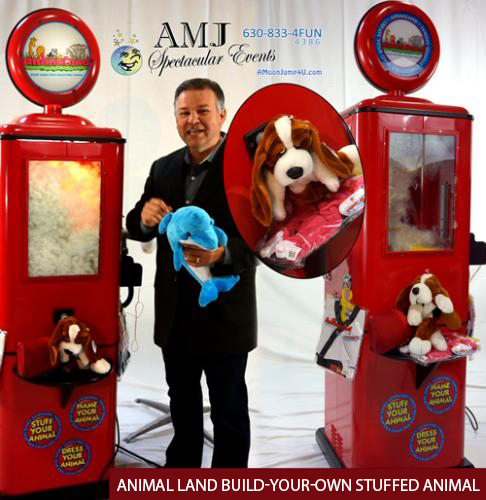 Reserve your machine from AMJ today! Get your cameras ready. Kids have so much fun creating their own fluffy friend to take home. We have several different animals and outfits that will be perfect for your custom event. Kids love to pick out their special friend, make a wish, choose a name and build a new best friend. Each animal will go home with a birth certificate with your child's name and date on it. Your can even go on the official website and register as a member of Animaland. How about rent this for your holiday party? Each child (or adult) can choose their own present and have a hand in making it themselves! Best. Holiday. Gift. Ever!